With NASA's rather surprising decision to split the Commercial Crew Program prize between Boeing's CST-100 and SpaceX's Dragon 2 capsule, America is officially back in the manned space exploration game! Woohoo! 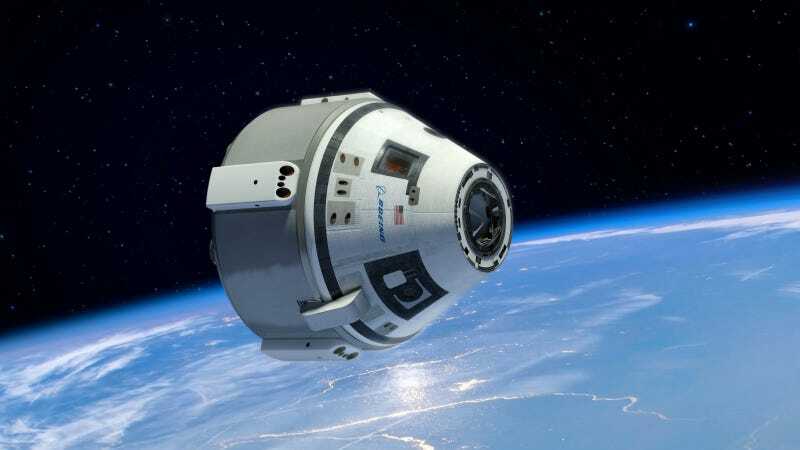 And even better, our astronauts will be shuttled to the ISS in style aboard the spacious CST-100 from Boeing. The CST-100, like the Dragon 2, is designed for a singular mission: ferry five passengers—up to seven in a pinch—between the planet's surface and the International Space Station in low Earth orbit. The craft is rated for 60 hours of free flight and can remain attached to the ISS for up to 210 days before it must return to Earth. Should commercial space stations, such as the one proposed by Bigelow Aerospace, actually come online in the next few years, NASA would reportedly have no problem delivering to them as well. So really, it would be less of a taxi and more of a Zipcar. Now, there's a good reason this thing looks almost exactly like the Orion Space Capsule. That's because Boeing recycled that design for this program after narrowly losing the Orion contract to Lockheed Martin. Its exterior shell utilizes a unique weldless design to house the pressurized inner cabin and can be reused for up to ten trips before requiring replacement. The 16 foot tall, 15 foot wide, 10 ton vehicle may have slightly smaller exterior dimensions that the Orion but, like the Doctor's Tardis, the CST-100 is bigger on the inside. Comfier too. Apollo-era crew modules were nothing short of revolutionary for the times they were built in, but because they had to be so versatile their cabins were crammed full of redundant and potentially unnecessary systems and consoles. The CST-100 is different though. Because it does exactly one thing—travelling to the relatively short distance to the ISS and back—all of the extraneous support systems can be done away with. This results in an astonishingly open and spacious capsule interior. What's more, the flight controls are designed to be far more intuitive than the menagerie of blinking lights and toggles of the Apollo era. "What you're not going to find is 1,100 or 1,600 switches. When these guys go up in this, their primary mission is not to fly this spacecraft. Their primary mission is to go to the space station for six months. So we don't want to burden them with an inordinate amount of training to fly this vehicle. We want it to be intuitive," Boeing's director of crew and mission operations and former shuttle commander, Chris Ferguson, told Aviation Week. To that end, passengers won't even really see or interact with the actual command console—Boeing has designated it proprietary technology—they will be instead issued "electronic flight bags". These tablets operate like Harmony remotes aboard the CST-100, controlling every port, engine, subsystem, and vent that previously required a toggle switch and blinking light directly from the device. The flight controls have been drastically simplified, not only to make them more intuitive for the astronauts and reduce their training times, but also because the capsule handles most of the flight control autonomously. With all that extra space, Boeing has spent an inordinate amount of effort making the capsule's interior are posh as the First Class section of a 737. That includes more ergonomic accommodations, frickin' Wi-Fi, and in fact, the ambient LED lighting aboard the CST-100 is actually from a 737—it's Boeing's Sky Lighting system.